Our client came to us wanting a landscaping design that looked stylish and eye-catching and included a specially designed space for entertaining family and friends. 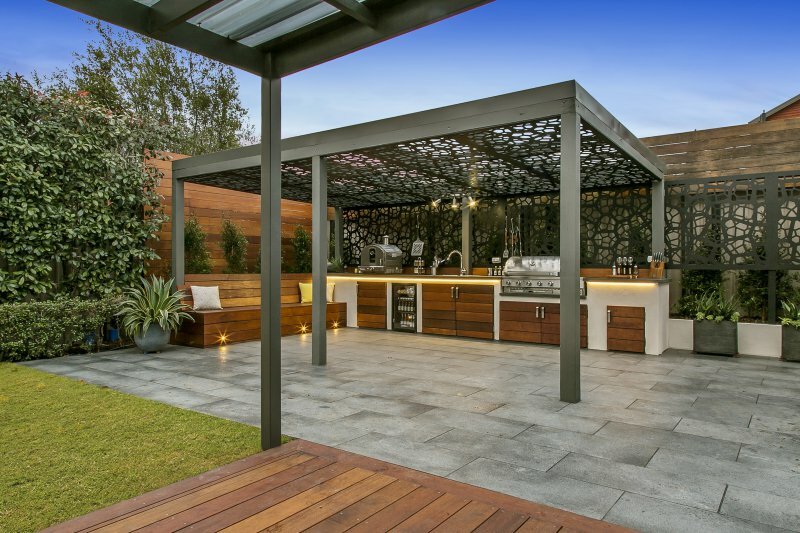 Our clients did not have the entertaining space inside their house that they craved and needed, so creating an area that was highly functional with an outdoor food preparation area and a large space was very important to enhance their lifestyle. In this particular design, we designed and created a beautiful large undercover entertaining area with easy access to the house complete with a custom made outdoor kitchen including a fully functional sink, large stainless steel barbeque and pizza oven and an outdoor fridge. 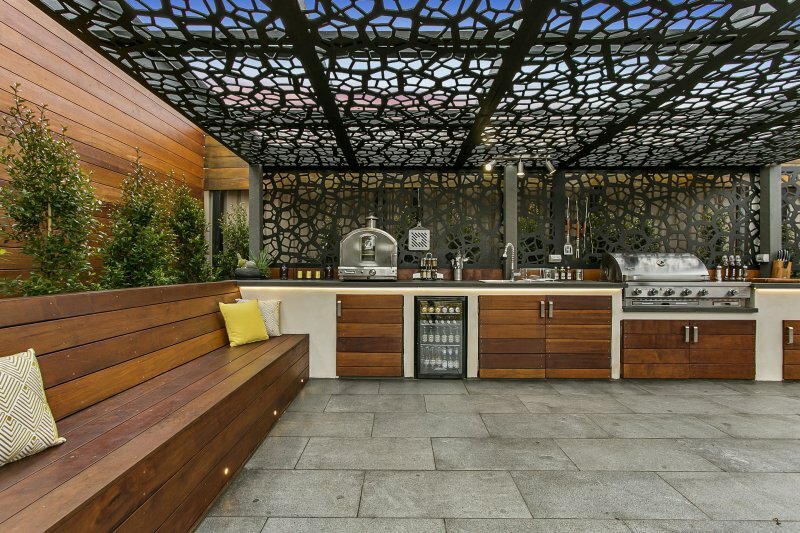 Everything the seasoned entertainer could ever want in an outdoor kitchen. All the bench tops were made from natural bluestone with merbau cabinetry underneath flowing into merbau seating and planter boxes. White rendered walls provide texture and finer points of detail as well as ensuring the kitchen area is able to withstand the harsh Melbourne weather conditions. Large granite pavers complete the area adding further sophistication and style. Decorative laser cut screening was designed and custom made specifically for the area. The screening was powder-coated to ensure it’s longevity and create a lovely finish. The screening clearly defines the space as well as providing style, shade and sophistication to the area. LED Strip lighting and small spot lights are used throughout the Alfresco area to provide style and functionality and extending the use of the outdoor area well into the night.